(MENAFN - Gulf Times) The Election Commission yesterday banned Uttar Pradesh Chief Minister Yogi Adityanath and Bahujan Samaj Party leader Mayawati from election campaign for 72 hours over hate speech targeting Muslims. Also banned were Samajwadi Party leader Azam Khan for sexist comments and Bharatiya Janata Party leader and Women and Child Development Minister in Prime Minister Narendra Modi's cabinet Maneka Gandhi after video emerged showing her telling Muslim voters in her electorate that if she won office without their votes, 'then when a Muslim comes to me for work, I will think, let it be, how does it matter? The Election Commission, which manages the polls and is considered one of the country's most upstanding institutions, had received strong criticism for not acting to curb the rhetoric being traded by candidates in recent days. Adityanath told a crowd last week that if the BJP opponents had 'Ali, we have Bajrang Bali. After the election regulator flagged the remarks, Adityanath said they were in retaliation to those of the Dalit leader Mayawati, who in a speech days earlier had urged 'especially Muslims not to split their anti-BJP votes. The poll panel also asked Adityanath to explain his remark calling the Indian Union Muslim League (IUML) a 'virus and saying the Congress was infected with this 'green virus. The Election Commission ruled yesterday that both leaders had made comments that could 'aggravate existing difference or create mutual hatred between religious communities, and temporarily banned them from the election trail from 6am today. 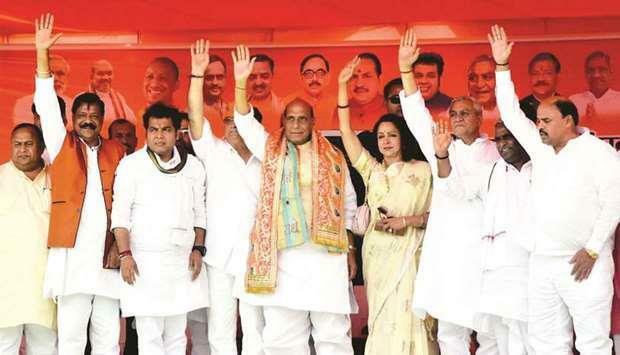 The commission banned Azam Khan from the campaign trail for 72 hours, calling his comments against actress-turned-politician Jaya Prada, his BJP opponent in Rampur, 'not only indecent but also derogatory and totally uncalled for. Gandhi meanwhile said her comments were taken out of context. The BJP has been playing to its nationalist base and painting its rivals as soft on terrorism and eager to appease Muslims. A BJP spokesman said the party was inclusive towards all communities. 'The party believes in all-together development for all, and we don't believe in any polarisation, spokesman Harish Srivastava said. The six-week election season that started last week has been rife with incendiary religious appeals, particularly from the BJP, whose overarching political goal is to forge a cohesive political identity out of the country's extraordinarily diverse community of about 1bn Hindus. On Thursday, the BJP president Amit Shah told supporters at a rally in Assam that if re-elected the party would rid India of unauthorised migrants - except for Buddhists, Hindus and Sikhs. The government is proposing a bill to fast-track asylum requests for refugees who follow those three religions, but not for Muslims. The Supreme Court said yesterday it would examine whether election authorities had enough power to clamp down on hate speech.